Choosing the right visualization for your business dashboard is a key element in designing a dashboard. To help you with this, we've put together an overview of the different types of visualizations you can use on your dashboard along with tips on when to use them. Tables are used to organize data into columns and rows. The table visualization is highly flexible in that you can use it to display graphical elements, such as bullet charts, sparklines, and icons. Tables can also be set up to use drill-down functionality or be used to create a heat map. Tables are ideal for displaying two-dimensional data sets that can be organized categorically. Table cells can contain other graphical elements, such as a bullet chart, to add context to the values being displayed. You can also use drill-down capabilities to explore large data sets that contain values that have a natural drill path. For example, Nation > Province > City > Store. Tables can become overwhelming if you're displaying large amounts of data. Rather than confusing your audience by displaying 100s or 1000s of rows of data in a table, consider using a line chart to succinctly communicate the pattern behind the data. If your audience is interested in the nitty gritty details, then use a drop-down menu to allow your audience to filter and segment data based on their requirements. Line charts plot values as a series of points on a graph and then connects those "dots" with lines to clearly demonstrate the pattern behind the data. Line charts are ideal when you're trying to spot trends and patterns in the data, and when it's not important to view the exact values to understand what's going on (although tooltips do allow for a bit of exploration). Line charts are best used when you're trying to understand the general trends, fluctuations, and patterns associated with a data set. By plotting multiple series on a chart, you can quickly compare two or more related data sets. If you're looking for an in-depth view of the numbers, a line chart isn't your best option. Likewise, if you're comparing categories of values, consider using a bar chart or a pie chart instead of a line chart. Bar charts display values as rectangular bars to compare values that are related categorically. 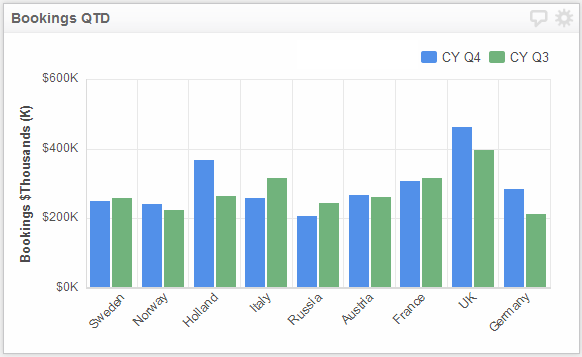 For example, displaying values associated with different nations makes sense using a bar chart, since Sweden and Norway are categorically related. Using a line chart in this instance wouldn't make sense, because it implies continuity between categories when that pattern doesn't exist. Use bar charts when you're trying to compare two or more values that fall within the same category. Bars can be stacked to show how multiple, similar data sets relate to each other. For example, showing car, van, and truck sales in 5 different countries. If the category only has a single value associated with it, use a bullet chart or a gauge. If the data set tracks values over a set period of time, use a line chart. Gauges are great for showing progress toward an objective, and are a mainstay of any business dashboard. Gauges are often coloured to clearly demonstrate when values are either hitting their target or missing the mark. Like the dashboard in your car, gauges and meters are best used when tracking single metrics that have a clear, immediate objective. Consider using a gauge to track sales and marketing goals, or revenue performance. Learn more about digital marketing KPIs that utilize gauges. As mentioned, gauges are best used to track a single metric. If you're going to be tracking multiple metrics, consider displaying multiple bullet charts in a table. Sparklines are simple line charts without any axes or legend associated with them. They are designed to be a succinct way to indicate trends and patterns over time. Sparklines are best used for providing context for values displayed on your business dashboards, and are often displayed alongside those values in a table. Sparklines work well when they're paired with a metric that has a current status value, such as current call volume, and when that metric is tracked over a period of time. This allows your audience to quickly understand current performance within the context of recent historical performance. Sparklines are used to augment a value or metric by showing the trend behind those numbers. As sparklines lack any axes or legends, you should be wary of plotting multiple series, and should instead use a line chart to elaborate on the trend. Pie charts: Show values relative to the whole. Maps: Plot values on regional maps based on your requirements. Scatter plots: Plot values on a chart to show the correlation between two sets of values.